This design is free from the Knitty website. 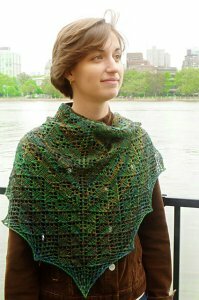 : "Semi-precious is a triangular shawl with a garter stitch border that is knit from center back to the bottom edge. Yarnovers at each end and along the center stitch are used to form the triangle shape. Increases are worked on right side only." Size US 8-24" circs (or sizes needed to obtain gauge) are required but not included. Finished Measurements: 54" x 25" (50" x 21"). Finished Gauge: 16 sts over 4". Color shown is in a hand spun yarn. Pattern suggested Malabrigo Silky Merino as a proper substitute. Cubics Fixed Circular Needles - US 8 (5.0mm) - 24"
$28.80 -- Kit price including yarn only (no book or pattern).